From picky eaters to food lovers! This week our chef created #JustDelicious delights for the kids that’ll go down a treat! Fry the bacon in a pan over a moderate heat until crispy. Set aside. In a mixer or large mixing bowl, cream the butter and sugars. Add the egg and vanilla essence and mix well. Add the flour, baking powder, salt, cocoa powder and chocolate to the creamed butter and combine until a ball of soft dough forms. Add the bacon and mix well. Using a 60ml (¼c) sized measuring spoon, create 20 cookie balls from the dough. Roll the balls in the icing sugar. 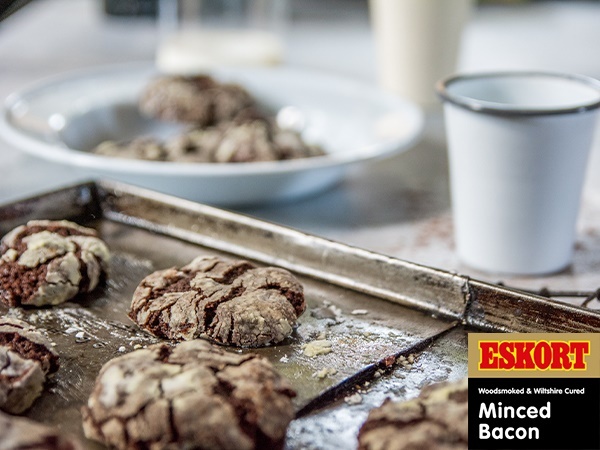 Place the cookies on a greased baking sheet and refrigerate for two minutes. Bake for 10 to 15 minutes, remove from the oven and allow to cool.